This is my first nano tank... its actually just meant as a temporary tank to hold fishes and shrimps while my larger "showcase" tank was undergoing the few weeks of growing a carpet of Hemianthus Callitrichoides via dry start method (DSM). This tank has been running for around 3 months now, its fully cycled and requires very low maintenance. Shrimps are breeding rapidly, dozens of small shrimplets regularly spotted grazing amongst the fissiden leaves and the fishes don't bother them. Very little algae seems to be appearing, i guess they are regularly cleaned up by the hardworking Otocinclus Affinis before they can take hold, so i actually increase the lighting duration periodically to help encourage more natural algae growth to feed them (blanched vegetables and algae wafers supplement their diet, but i still want them to hone their algae eating skills). The Up Aqua Z-Series Pro light is bright and very efficient (the 30cm version only draws 10.7 watts), this light set has 2-3 times more LEDs than most other similar systems i've seen so far, which results in much better light coverage. It has a very slim casing too, so it matches the tank aesthetically and i can still access the tank easily to do basic maintenance without needing to move the light set. So far, i can see the Fissidens Splachnobryoide growing and spreading further on the bogwood, so this LED light set seems to be quite effective for that type of moss. Special credit goes to jamesneo at the Aquatic Quotient forum, he was the one who created the fissidens on bogwood structure and it fit perfectly as the main centerpiece of this nano tank. Danio Margaritatus look great but are incredibly shy fishes (i've read that they are very shy fish, but i never believed how skittish they really were until i got them), i added them as one of the first tank inhabitants but hardly saw them as they prefer to mill about at the bottom area of the tank. If they detect even the slightest movement outside of the tank, the little chaps will quickly hide behind or under the bogwood. I figured having "dither" fishes of similar size might help, so i added in a group of Danio Tinwini. These fishes look very cool (like miniature leopards with their mix of spotted patterns on top of iridescent gold scales) and are very sociable. In addition, they naturally school around the middle and top levels of the tank. The bogwood cave... looks empty, but whenever i shine a torch into it to check, there are always shimp or fish hiding there, at one point during one of the monthly tank maintenance activities, i found almost a dozen fishes all huddled inside that small cave space! excelente acuario, me gusto mucho tu diseño y déjame contarte que estoy armando algo parecido con riccia y fissidens sin CO2y sin fertilizante pero con la misma luz Up Aqua Z-Series Pro LED Z-10 (30cm), la cual tiene excelentes resultados para este tipo de plantas por que las desarrolla rapidamente. Really nice bogwood, did you DIY or did you buy it? Where you buy those tanks? If the tank is in front of me, I'd probably gaze into it unaware of the passing of time. In the unlikely event that you give up the nano, may I buy over from you? What's the pricing like for the tanks bro? Hmm those that I saw in the lfs were more like 3-4cm. That's why I ask. I thought of adding them toy tank as well. They look pretty! There are many species of danios... most likely you saw the more common ones at the various LFS, which are usually larger in size. Hi where did you buy your danio tiniwini? I tried C328 but they never sell. I got my Danio Tinwini from Qian Hu Fish Farm... so far that's the only place i have found them, but it was a few months ago, so not sure if they still have anymore in stock. Hi there, do you recommend HC or Glossostigma for a low-tech nano tank setup without CO2 tank? Trying to achieve carpeting for a shrimp tank (Sakura/Cherry). Will the Aqua Z-series be sufficient as the light source as I know these flora require strong lights? 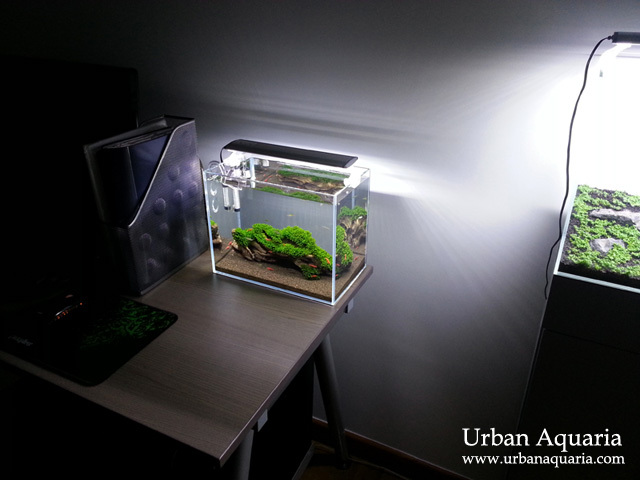 Plan is to have the exact equipment setup as your nano tank but using rocks(Iwagumi) instead of Bog/Driftwood. Any good lobangs to get nice rocks? If you are going to do a dry start method (DSM) for the tank, then its possible to use HC for a low tech setup (ie. without Co2). You just have to make sure the HC establishes strong roots and large plant mass during DSM before filling the tank. After that, you'll need to control the plant selection (only HC as main plants, no other competing plants) and strictly maintain a low fish bio-load, so that the tank conditions are balanced. The Up Aqua Z-Series Pro LED lights are sufficient for growing and maintaining a HC carpet. If you are not planning to do DSM and prefer to start the tank already filled, then plant Glossostigma instead, it roots and establishes a carpet easier than HC and has comparatively lower demands... but its leaves are larger so it tends to change the sense of scale in smaller tanks. As for rocks, you'll have to check at the various local aquarium shops to see their selections. Note that rocks will usually alter the parameters in a tank, so make sure you test them before using (ie. soak them in a bucket of water for a week, then test the water parameters). Hi Urban Aquaria, may i ask if you purchased all your peripherals from GC (filter, light, lily pipe)? And the o-rings? Is the steel mesh guard too big for the lily pipe? Sorry because your set-up is really clean and neat, hence I'm asking you all these questions. Hope you don't mind! Yeah, the steel mesh guard was meant for 13mm lily pipe intake, but i'm only using 9mm lily pipe intake (due to the filter using only 9/12 size hoses)... so i have to use rubber o-rings to get it to fit properly. I got the rubber o-rings from neighbourhood hardware shops, had to test a few to find the right ones. 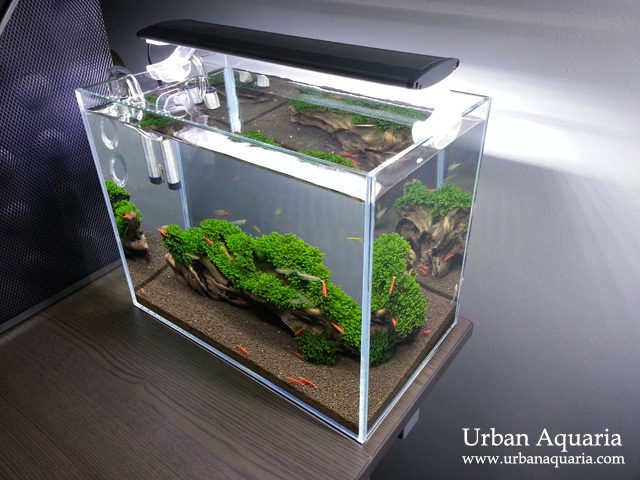 Thanks Urban Aquaria for your posting. I very much like this. How can I get this? Would you please tell me? If you are referring to the tank and equipment, you can get them from aquarium shops like Green Chapter, East Ocean or Seaview in Singapore. Hi there .. I've gone through almost every single article in your blog and you've really got a talent. What you do is Art more than anything else. Your blog inspired me to think about having a small tank of my own to start off with and that got me started reading about the initial basics. You've mentioned in this blog that the tank is fully cycled and it has cherry's in it. Would you mind telling me how you cycled your tank and what was the initial source of Ammonia for the Biofilter to stabilize? Every US based site talks about adding pure Ammonia. But i haven't been able to find any place in Singapore that sells it. Okay, for those forum threads and guides online which mention adding ammonia into the tank water to do a "fishless" cycle, they are referring to tanks which use gravel or any other inert substrate. Hey there.. I know i'm late in thanking you but post above helped me in starting my nano tank. My main focus was on the Cherry Shrimps and after 2 tries have successfully managed to go from 8 Cherries to 22 with a few more currently berried. So thanks a lot again. 1. If I change the filter to the one in this blog (Eden 501), can I use the same filter media of his current filter ? Since it is a cycled tank and would have all the good bacteria in it. 2. I went through your DSM blog for starting a HC carpet, but I won't be able to do it using DSM. I wouldn't know what to do with the fish and I don't want to lose out on the bacteria in the filter and wood that he has by drying it out. My question here is if I were put in the HC with the tank filled, would it still grow with light on for 6-8 hrs a day ? I won't be using CO2 injection however I could try Seachem Excel. Any advice on this would be great. Yes, you can transfer the bio-media from the older filter to the newer filter, the beneficial bacterial will also be transferred across too. Note that the Eden 501 is more suitable for smaller 1ft tanks... for a 2ft tank you should go for a larger filter, something like an Eheim 2213 or Eheim Ecco Pro 130 (or higher). As for the HC carpet, you can plant it submerged in a flooded tank (most people do that), but without Co2 injection it's overall growth rate will be much slower due to the limited carbon supply, so you'll just have to wait longer for it to grow out. Seachem Excel can help improve the HC growth rate, though not as much as Co2 injection, but it helps. Hi, Thanks again for your quick reply. I went back and checked the dimensions of the tank and its actually 45cm x 26cm x 25cm . Would you still suggest the Eheim 2213 or Eheim Ecco Pro 130 ? or something smaller ? Also, You mentioned about the HC carpet growing much slower without CO2. Would any of these help ? If i do start with CO2 injection, do I need to keep using it for as long as I have the tank ? or can i stop it once the HC carpet grows ? Thanks a lot for getting back to my silly questions. Your advice is much appreciated. Okay, although the tank dimensions is smaller than a standard 2ft one, its still around 29+ liters volume, so i would still recommend a canister filter like the Eheim 2213 or Ecco Pro 130 (or equivalent filter), more flow rate and filtration capacity is always better for planted tanks. You can easily adjust the flow rate using double taps to moderate the current anyways. Those Co2 systems you listed are the basic starter kits which use disposable cartridges with manual regulators, although they are cheaper initially, they don't have solenoid regulars so you either need to leave the Co2 running 24 hours a day or remember to switch it on and off every day, which is a hassle as you need to keep resetting the bubble count, and could result in inconsistent Co2 supply that may end up encouraging certain types of algae (ie. black beard algae). In addition, the disposable cartridges run out very quickly (each usually only last a few weeks) so you need to constantly buy more cartridges every month, over time it ends up costing more than just buying a full complete system in the first place. At S$184, you get everything required to setup a complete proper Co2 system, it uses a solenoid regulator so the Co2 injection can be scheduled according to the light photoperiod, much more efficient and hassle free. Refills usually only need to be done every 1-2 years and cost only $15-20. Btw, once you use Co2 injection to grow out the HC carpet, its recommended to continue using it long term to maintain the healthy growth of the HC, otherwise if you remove the Co2 injection, the new HC growth will slow down significantly and the older HC will start melting faster than they can be replaced, so you'll see the carpet gradually deteriorating over time. Thanks a ton for the detailed explanation on the filter and CO2 systems. I'll definitely be paying East Ocean a visit this evening. Sorry to keep adding on to this. I have a few more questions. - HC Pots/Trays (depends on brand and quantity) = Seaview, C328, East Ocean, Green Chapter, Fishy Business. - ADA Amazonia Aquasoil = C328, Polyart, Y618, Fishy Business. - Lily Pipe Set (depending on the design and quality, make sure you get the good quality ones which are angled properly) = Seaview, East Ocean, Green Chapter, Fishy Business. - Filter (depends on the brand or model) = Seaview, C328, Green Chapter, Fishy Business, East Ocean. - Up Aqua Z-Series Pro LED Z-15 = Seaview, East Ocean, Sun Pets. Overall, Seaview is usually abit cheaper than the other places (they have store-wide promo discounts on plants and equipment) and should stock the HC pots/trays, lily pipe sets, filters and lights... the only thing they may not stock is ADA Amazonia aquasoil (you'll have to check), which you may need to get from other places like C328, Polyart, Y618 or Fishy Business. So I did a little shopping over the weekend based on the information you provided above. Got the ADA Amazonia Aquasoil and 2 HC Pots from C328. ANS Lily Pipe Set, Ecco Pro 130, Up Aqua Z-Series Pro LED Z-15 from Seaview. My wife banned me from entering the house if I had picked up the CO2 set so that was out. I picked the Aqua soil first from C328 on Fri evening from C328 for 68$ and saw it for 78$ at Seaview on Sat. Even though Seaview offers the 15% discount I think the prices are raised first before the discount is offered. To be honest I'm not really sure what the actual price of the 9L bag is. The HC pots I got were from Tropica 1-2-Grow. Quite expensive but they looked really green. Its only after i got home and washed off the jelly at the base did i realize there were no roots. I'm not sure how HC works but I cut it into small bunches and planted them like you show in your DSM blog. Is that how HC pots usually are ? I also picked some grass like plants that were tied to a mesh and planted them around the tank ( mostly at the back). I picked up the Seachem Excel Flourish too. Put in a cap full after filling in water last morning and put in a few drops this morning too. How often do I keep adding in the Flourish Excel and in what doses ? I dont want to OD the tank and have dead fish and plants. The lights will be kept on most of the day while i'm at work. Thanks a ton again for everything. 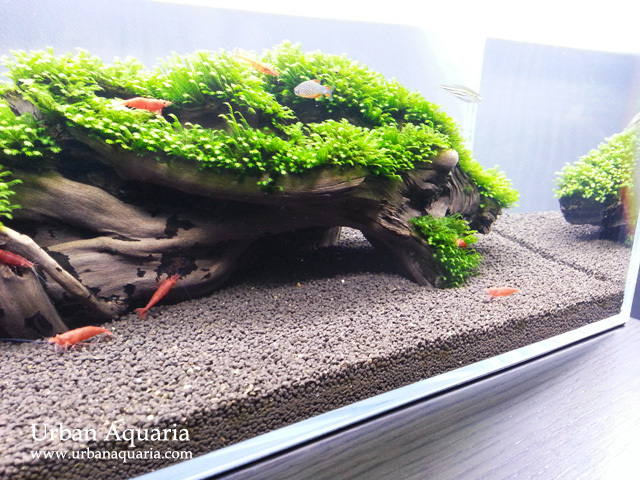 The price of the ADA Amazonia Aquasoil "Powder Type" 9L version is usually around the +/- S$70 range (the "Normal Type" 9L version is cheaper at +/- S$40, but the granules are larger so not as nice for smaller tanks). Tropica 1-2-Grow plants are tissue cultured young plants, they have very little roots as they grow in nutrient gel anyways. They are expensive but due to their healthy form, they tend to transition much faster when submersed. You just need to wash away the nutrient gel (helps prevent mold growing around it in the tank) and them cut them into individual small plugs to plant into the soil substrate. The HC pots and mats which i used are mature plants from LFS and plant farms. They do well when grown using DSM (since they are already in emersed form anyways) but tend to take longer to transition when planted submerged in tanks, so its a trade-off. As for Seachem Excel, you should just follow the recommended dosage instructions on the bottle based on your tank's actual water volume (less the substrate and hardscape volume). Use the cap to measure the amount to dose and its best to dose the recommended daily amount on a daily basis (as the excel only lasts up to 24 hours in a tank). At the bottle recommended dosages, it is safe for the majority of fishes and shrimps. For your lights, use a plug timer to auto-schedule and limit the photoperiod to 6 hours during this initial grow out period (you can gradually increase the photoperiod as the tank stabilizes and the plants grow in density). If the photoperiod is too long during the initial startup period, algae will grow and take over the plants very quickly due to all the excess light and excess nutrients being released by the aquasoil and the current lack of plant density to use them effectively. So its been a like 2 weeks since I setup the tank based on your inputs and I had a few things to share. The HC that put in all melted off in the first week itself. It felt like it dissolved in the water. I'm not sure what i did wrong with that but thought it was too expensive / demanding of a carpet for a beginner like me without CO2. So I went and got the slightly cheaper version and less demanding (based on what i read online) sibling "Monte Carlo". I'm not sure if they fall in the same category but I see a few roots of the Monte Carlo that have started growing. I had also put in something that looked similar to 'Eleocharis sp. Mini'. I'm not sure what its called but it has firm and dark hair like strands compared to the Eleocharis sp. Mini. This one seems to be growing quite nicely. i see a lot of new runners all around them and even see them shooting up between Monte Carlo that i have planted in. Now I think it was a mistake putting both of them in the tank. Checked for Ammonia last night and it showed 0. Nitrites on the other hand is very high. Did a 50% water change too. I'm surprised all the fish are still fine. or at least they look fine. Will take some more time for it to cycle completely i guess. I'm feeding the fish flake food but its a pain to see and remove half the flakes that sink to bottom and get stuck to the grass. I've tried feeding them pellets but they didn’t seem to eat them. Is there anything simpler that you feed your fish that makes the tank look less messy ? Thanks for all the help. And sorry to keep bugging you on your blog. Yeah, HC is tough to grow submerged without additional Co2 injection, they tend to melt faster than they can grow in such conditions so the chances of success are lower... that's one of the reasons why people do DSM to establish HC for a few weeks first, before flooding the tank (especially for non-Co2 injected tanks). Monte carlo is alot easier to grow and less demanding, their leaves are larger than HC so that's the only trade-off, otherwise they are nice carpet plants too. Looks like your tank is still in the cycling phase, do more frequent water changes to reduce the toxic effects on the fishes, they may not exhibit issues now (they are evolved to seem to look okay even in spite of averse conditions, its to prevent them from being singled out and preyed upon), but constant exposure to ammonia, nitrite and nitrate spikes can lower their immunity and result in illness or longer term health issues. As for food, you can get those commercial fish foods that only float on the water surface (and don't sink), or those that float for a brief time and then sink very slowly. You can also look into getting a glass or acrylic feeding dish and place the food in it (so that the food doesn't drop and get trapped in the carpet plants and substrate). The fishes need to be conditioned to eat pellet foods, so just carry on the routine, when they are hungry they will learn to eat it. If you notice alot of the food sinking faster than the fishes can eat them (or alot of excess uneaten food), then its a sign you are overfeeding. Fishes need alot less food than we think, so try to cut down on the feed amount. Just for reference, i only feed my fishes once every 2 days and at very tiny amounts, like only 1-2 micro pellets of 0.5mm size to each small fish (those 2-3cm length ones). Very often when i travel overseas for work, i don't even feed them for up to 5 days and all of them are still okay. Light is rarely too much in a tank during DSM as there are no issues with algae and the plants have full access to Co2 direct the air, so they can gain maximum growth from the lights. Its okay for the HC leaves to dry abit between mistings, as long as the soil itself is damp and there is water inside the soil (just look at the soil layers at the front and sides of the tank glass, there should be visible water inside the bottom layers of the soil), the plant roots will be able to absorb water wicked up from the damp soil. That being said, if the tank is in a closed room with air-con or dehumidifier switched on the whole day, they you may need to partially cover the tank to reduce the loss in humidity and prevent the soil from drying out too quickly. Otherwise, leaving an open top and regular misting is sufficient. As for plants that are browning, If you refer to my HC DSM journal, the plants will naturally go through a transition period during the first 1-2 weeks, so the older/damaged leaves will brown and melt away while the newer healthy leaves grow out. Just use a pair of tweezers to remove as much of the brown/dead leaves as possible as part of your regular plant maintenance regimen. I use tap water treated with de-chlorinator solution (ie. Seachem Prime). Shrimps not surviving could be due to many reasons, check the water parameters (ammonia, nitrite and nitrate) to confirm that the tank is fully cycled with stable parameters. Doing a GH test could also be useful as mineral content that is too high or too low could also affect their molting process. Doing a slow drip acclimation process (do a google search on that method) before adding the shrimps to the tank also helps them adjust to the tank conditions and improve their survival rate too. If the shrimps only die at an average of one a week, then i wouldn't be worried... those would just be the weak or old ones (they have relatively short lifespans), think of it as simply natural selection. I also see a shrimp or two die every week in my tanks too, the other shrimps quickly eat them up, no wastage. In a sizable and healthy shrimp population, the berried shrimps would be producing dozens of shrimplets every month (often every week), so the shimp population would still increase way faster than the few that naturally die off. Hi. Very nice. How much did you spend in total for this tank? Thanks. So for just the equipment, the total was SGD$124. The soil, hardscape, plants and livestock worked out to an additional SGD$20-$30. Awesome tank! You always do such a great job! how many fish can this tank support? are they still alive? For a 13 liter tank with ample filtration and regular maintenance, it is possible to keep around 6-8 small fishes (ie. 2-3 cm length ones) along with a group of 15-20 small shrimps. I use it as a temporary tank though... i don't keep fishes in this size of tank for long term, its usually only used as a holding or quarantine tank. I'm just wondering what your thoughts/opinion on the Eden 501 filter is? Particularly regarding the build quality. I to have the Eden 501 filter and will soon be installing it in a 30cm x 30cm x 30cm aquascaped aquarium. So far it appears to be a good quality filter, although I do have an issue with the intake strainer. When I was putting the filter parts together, I noticed that the intake strainer was particularly loose when inserted into it's coupling on the impeller housing/cover. The coupling secures the intake strainer enough, but when the cover of the filter is placed on top of the canister and (locked into place) the intake strainer is inserted into the hollow of the sponge, the intake strainer becomes loose and then rests in the hollow of the sponge. Essentially the intake strainer doesn't sit or isn't coupled tight enough to the impeller housing/cover, then falls out of the coupling. I spoke to the shop that I purchased the filter from, and they suggested cinching a cable tie/zip lock tie around the coupling, which would in turn, cinching around the top of the intake strainer. I am yet to use/switch on the filter. I am concerned that the intake strainer will or already is loose and will not strain the water and could possibly cause damage to the rest of filter. I believe that the strainer/filter that I have is just a bad individual filter, and not that the entire filter is faulty, just the intake strainer and or the coupling on the impeller housing/cover. That being said, on the below video, at 2:25 the intake strainer is not attached to the impeller housing/cover. I would presume it has become loose and is also resting in the centre hollow of the sponge. Yet at 2:58 it is inserted in the impeller housing/cover. Have you to had this or a similar issue? If so what did you do to solve the issue? Would you recommend I return the filter to the shop for another 501 filter? Thank you for your assistance. Keep up the great work on the aquascapes, they are brilliant! I guess the fitment of the intake strainer could differ depending on the production batch... in my units they stayed attached quite securely and don't pop out during maintenance. Since the strainer and impeller cover are joined together via friction fit, it can vary depending on molding of the plastic parts. Try and test the strainer when attached to the impeller cover, if you shake it and the strainer keeps falling out, then its too loose. The shop's suggestion of using a zip tie to create a more secure fit might help, its worth a try. If its still loose, then just have to exchange it for a new unit. Hopefully the new set will not have the loose intake strainer issue. I've decided that I'll try and exchange my current Eden 501 filter for another. Even with a zip lock tie/cable the intake strainer is still somewhat loose and the zip lock tie/cable tie doesn't grip onto the plastic securely. It’s irritating, other than the fact it’s a brand new filter, it’s as you said, just a bad batch. I'm just desperately hoping that the replacement filter doesn't also have an ill-fitting intake strainer also. I read your review on the acrylic lily pipes last year and have been contemplating buying a glass set. It would be my first set of lily pipes, would you suggest I purchase a glass set or acrylic? My hesitation being the brittle nature of glass lily pipes and hence my interest in the acrylic set. But glass does look more stylish and appealing. I plan on installing the lily pipes in the future into my cubic foot (30cm x 30cm x 30cm) aquarium. Are your set of acrylic lily pipes 10mm or 12mm set? Do you think that they are too intrusive in the aquarium, particularly regarding the size? Have you had them installed in a/your nano tank? Again relating to the size of the lily pipes in the nano aquarium. Would you recommend the same size lily pipes for my cubic foot aquarium? Would you recommend glass or acrylic lily pipes to a first time lily pipe owner? Also, regarding the filter location. You have mentioned a while ago that you have placed the Eden 501 filter on the shelf below the aquarium. Do you think that it has the strength to pump and filter from a lower height, as opposed to having the filter on the same shelf/level as the aquarium? Have you seen or heard the filter waning or struggling? Do you think that damage could occur from having the filter on a lower shelf, the stress of having to pump and filter from a lower height? Again, thank you for your assistance. I very much appreciate it. I apologise for the bombardment of questions. The Eden 501 uses 9/12 hoses, so it can only fit lily pipes which use those hoses too... unfortunately none of the acrylic lily pipes available online (as far as i can see) come in 9/12 sizing. Therefore you'd have to go for the glass 9/12 versions. For your 30cm tank, its better to use the smaller lily pipe designs which are angled closer to the glass walls, there isn't much horizontal space in a 30cm tank so a larger or longer lily pipe would jut out too far into the tank. You'll have to check around the shops to find the right designs. For convenience, i'd usually prefer acrylic ones nowadays because they are very easy to handle and never break (i use them for the majority of my general purpose tanks now), but glass does look clearer so it still has its appeal (hence i use glass lily pipes mainly for my display tanks), just have to be more careful when handling and cleaning them. Do note that 9/12 glass lily pipes are much narrower and have much thinner glass walls compared to the normal 12/16 pipes, so they are even more fragile. You have to get suitable smaller flexible pipe brushes to clean them properly. The Eden 501 is designed to be placed beside the tank for optimal flow rate, but if placed below the tank, the flow rate simply reduces accordingly (it reduced to around 200 l/ph when placed 30cm below the tank), it just simulates abit of extra resistance (similar to adjusting a tap). The original Eden 501 flow rate was already too much for my tanks anyways and i had to use a tap to tune it lower, hence the reduced flow rate was okay for my setups. So it just depends on how you want to position it and how much flow rate you require. Was hoping to get some advice from you regarding tank cycling. My nano tank is more than 3 weeks old but the cycle doesn't seem to be starting. It's a GEX S tank, 314mm x 185mm x 240mm, fairly heavily planted using ANS Planta Soil with vals, S.repens, nanas and some sorts of rotala (i think). Running a Dophin H80 filter with the black filter sponge and some Mr Aqua CRs. I've been using Stability everyday since day 1 in hopes to boost the BB development but that seems to be in vain. I also added 2 otos and 1 nerite about a week and a half ago for algae control and have been dosing Prime everyday since to ensure their survival. 30% water change every 2 days since livestock has been added. My readings however have remained the same since day 1: 4-6ppm for ammonia, 0 for nitrites and nitrates. I understand that cycling takes quite some time but is it normal for there to be no change after more than 3 weeks? I only ask because my friend with a brand new similar nano set-up got it fully cycled in 3 weeks using Stability. A while ago I got a betta in a little bowl as a gift and after finding out they need more space, I got the GEX tank and filter and put the betta in the tank with inert gravel, ornament and some nanas and mosses on coconut husks. A week or so prior to planting my betta came down with what I suspect was columnaris so I dosed the tank with furan and after more research decided to go the route of full planted tank. So i moved the betta to a QT and dip-bleached the main tank, gravel and ornament before soaking them in dechlorinated water overnight and left them in the Sun to dry. I also threw out the old filter media and rinsed and aired the filter. With the new setup I reused the tank, filter (but with new media) and the ornament. Could any of those have residual furan or bleach that is preventing the colonisation of beneficial bacteria now? 3 weeks is usually still early days for a tank cycle... it can take anywhere between a few weeks to sometimes even a few months for tanks to achieve a stable cycle. Ideally you'd want to have a stable cycle with strong beneficial bacteria, rather than a fast but unstable cycle with weak beneficial bacteria. Just have to be patient and let the tank cycle on its own, eventually it will be complete. You never know... the tank may naturally finish cycling within the next few weeks, so its not really necessary to rush it. How long a tank takes to cycle depends on the filter efficiency, bio-media quality, plant types/density and the rate of ammonia production (ie. from aquasoil or bio-loads)... every tank setup is different so the cycling time will also be different. Stability is a useful product if you need to introduce livestock earlier, but it is only a temporary measure, the actual long-term beneficial bacteria will still need time to grow and establish in your filtration system and bio-media. The Dophin H80 filter is a very small filter so it doesn't have much space to fit much bio-media, hence the amount of space for beneficial bacteria to grow and live in is limited too... it would be a good idea to either upgrade to a filter with more bio-media space (ie. larger hang-on filter or canister filter), or use higher quality bio-media that has much larger overall internal/external surface area (ie. Seachem Matrix). As for the usage of medications and bleach, there is a possibility that traces of it might still be absorbed into the tank, gravel, ornament and equipment (even after being washed and dried), so there is a chance it could affect the cycle. I guess if you are not sure, then its better to just remove and replace those affected items. So it's normal for the cycle to still be stuck at 4ppm ammonia and 0 for the rest at this time? In that case I guess I'll just have to continue being patient then. Would you suggest that i continue the daily dosing of Stability or just leave it be now? Also, I tried using a Dophin H100 but it wouldn't sit on the rim of the tank securely and would be slanted and loose. And i'm afraid the minimum setting would still cause too strong a current for when I eventually put my betta in. With those considerations, what filter would you suggest to be the most cost effective and easiest to set up? With less things to hide and less clutter too. Would the UP Aqua External Hang On Aquarium Canister Filter 120 be a good idea as compared to if I were to get the Eden 501 and use it with the default tubings and intakes/outlets. I am looking at models with rainbars because, correct me if I'm wrong, they seem to generate less strong currents? Well, it really depends on the tank setup... different tanks go through different cycling processes (some longer, some shorter), so you'll just have to wait and see. Its not really necessary to dose Stability past the 1 week recommended schedule, though i don't think there is that much harm in continuing to dose it... perhaps its better to just give the various naturally occurring beneficial bacteria species a chance to grow in the aquarium. Many people don't dose any bacteria solutions and their tanks still eventually cycle anyways. Are you using a tank with plastic rims? If the hang-on filter can't sit properly, you'll have to find ways to adjust it to fit, try moving the angle knob at the base of it (the piece used to adjust alignment of the filter) or attach foam pieces to help do the adjustments. If you are keeping a betta, and its the type with long fins, then you'll have to reduce the flow and find ways to diffuse it (use additional sponge at the outflow ramp or use objects to block it). The other option is using sponge filters, but they take up valuable space in the tank. Bettas with shorter fins are usually more tolerant with abit of current though, so maybe can consider those types instead. 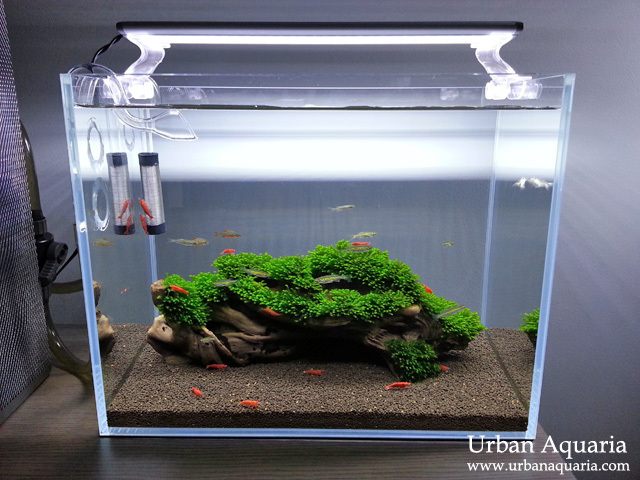 The Up Aqua EX120 is quite a good filter, it combines the benefits of a small canister filter and a hang-on filter. You can try that. Its flow rate is quite high though so you may need to adjust its flow lower. The Eden 501 is also a good canister filter for small tanks, its able to hold more bio-media and you have the option to use different types of pipes (ie. lily pipes), so there is flexibility in its usage. Rainbars can help to spread out the flow so they are one option, you can also use outflow pipes with wider mouths and also tune the flow lower too. In both case, you can adjust them to direct the flow towards specific areas, so there is some control in where the current moves to. Hi UA, do you have the contacts to the bogwood seller? Thank you. He usually has new mini fissiden on wood and rocks available for sale regularly every quarter, so do check his forum merchant sales threads for updated. Thank you UA! So i guessed it right. Will check it out with him. Hi, like your nano tank very much. Neat simple and green. Do you help to provide such set up Services and purchase from you? 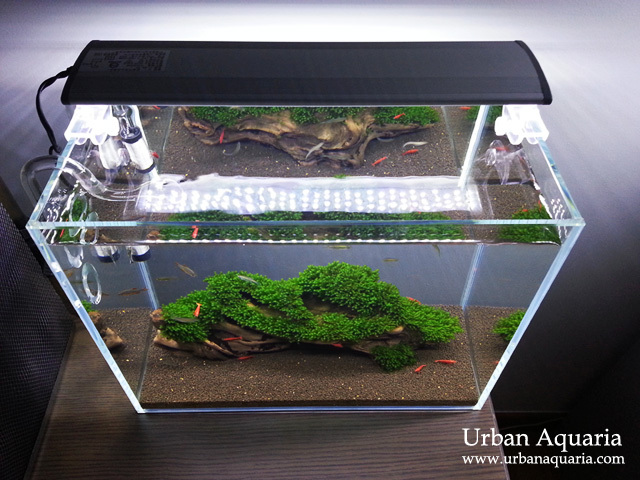 Or will you happen to have contacts for such nano tank setup service? thanks. Well, i don't actually do any nano tank setup services... but you could check with some of those popular LFS which specialize in aquascaping, like Green Chapter, Aquatic Avenue, East Ocean Aquatic, Fishy Business etc. Those LFS offer aquascaped tank setup services for their customers.